Bharat and Sheela Gandhi are uncanny Astrologers and Palmists with very accurate Astrology horoscopes/readings. 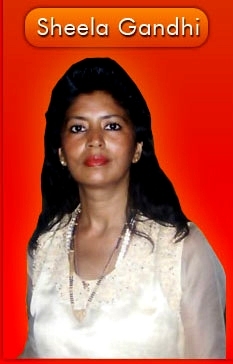 Sheela has more than 39 years experience in astrology and palmistry. She is available for readings in astrology, palmistry, clairvoyance, numerology, crystals, psychic and tarot cards. The astrology readings are based on Vedic astrology and they are very accurate. Sheela also does crystals combined with Astrology readings based on karmic planets and these types of readings are unique and very accurate. Sheela will highlight any blockages and problems in your life caused by your karmic planets. You can also have past lives karmas remedies done to ease your problems around you at the present and in the future. The remedies which are mentioned can be purchased separately.The accuracy and the depth of her readings will astound you and the remedies given will help you reach your goals with great ease. Sheela is a Law Graduate with a degree from the University of London. She has taken this path to help people from all over the world with their problems caused by their past lives karmas. Sheela comes from a family of astrologers and palmists going back to several generations. You can contact Bharat and Sheela on 0208 150 0070 for further information or to book readings by credit and debit cards. We accept all major credit and debit cards. Please note we do not accept any cash payments and you can pay by bank transfer before we confirm the consultation. Please call us for more details. Sheela is available for phone readings, by appointments only in person or through email for: Astrology, Vedic Astrology, Karmic Astrology, Palmistry, Crystals combined with Astrology, Horoscopes, combined readings of Astrology, Palmistry, Crystals, Tarot and Psychic readings. Sheela also does remedies to remove and protect against Black Magic, Dark Energy, curses and spells. Bharat is also available for Astrology, Vedic Astrology, Karmic Astrology, Palmistry and Removal of Black magic and protection from Dark Energy. Bharat has more than 45 years experience in Astrology and Palmistry. You can check out some of the latest testimonials from our clients and also the articles written by Sheela Gandhi on Astrology, Vedic Astrology, Remove Black magic, Remove Dark Energy and protection against evil spirits. Sheela Gandhi has written several articles on Astrology, Dark Energy, Black Magic, how to remove Dark Energy, Protection against black magic and removing evil spirits.